The first round of games will start at 8pm and run until 11pm. A total of 32 teams are taking part this year with the country’s leading newspaper FIJI Sun the defending champion. Team managers with organisers and sponsors during the Ovaltine Suva Business-house Futsal pool draws. 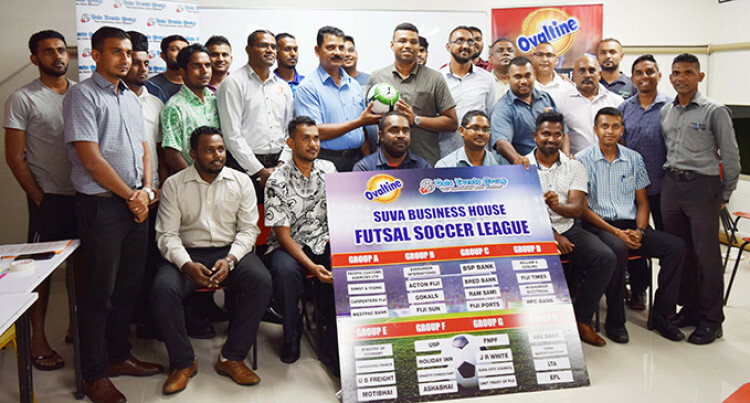 The 2019 Ovaltine Suva Business-house Futsal Football League kicks off today at the National Hockey Center. The first round of games will start at 8pm and run until 11pm. A total of 32 teams are taking part this year with the country’s leading newspaper FIJI Sun the defending champion. “Our theme this year is ‘Fight against NCD’ and we the Bula Events Group is taking a bold challenge to get corporate bodies to compete and stay healthy,” Events director Alan Avinesh Kumar said. “As the organiser, I would like to thank Ovaltine for sponsoring this year’s competition and wish all the best to the 32 teams. “Teams that have registered are BSP, Bred Bank, Pacific Customs Agencies, Ram Sami, Suva City Council, Gokals, Westpac, Erasito, Action Fiji, Fiji Ports, HFC, Carpenters Finance, JR White, EFL, Motibhai, Unit Trust of Fiji, Ministry of Economy, Fiji Sun, Evergreen International, William & Gosling, Ernst & Young, FNPF, Holiday Inn, Ashabhai, Intergroup Electrical, Fiji Times, LTA, China Navigation-Swire, ANZ, Carpenters Fiji Limited, USP, UB Freight. Court 1: 8pm Pacific Custom- Ernst & Young (PA); 8.30pm Carpenters Fiji-Westpac (PA); 9pm Evergreen-Action Fiji (PB); 9.30 Gokals-Fiji Sun (PB); 10 BSP-BRED (PC); 10.30 Ram Sami- Fiji Ports(PC). Court 2: 10pm W&G-Fiji Times (PD); 10.30 Intergroup-HFC (PD).